Second Republic vice president,Dr. Alex Ekwueme, took his final exit at exactly 2.40pm yesterday in his home town, Oko in Orumba North Local Government area of Anambra State. He was laid to rest in his expansive compound after a funeral service at St John The Divine Church, Oko, before a large number of mourners from all walks of life led by Vice President Yemi Osinbajo. Osinbajo, head of the federal government delegation to the event, announced the renaming of the Federal University, Ndufu Alike, Ikwo in Ebonyi State after the departed politician. He said the decision was in recognition of Ekwueme’s selfless service to the country. The former VP, Osinbajo said, practiced principles of personal sacrifice for others and would be remembered for many things not only by the people of the Southeast, but the entire country. The first son of the late politician, Pastor Goodheart Obi Ekwueme, thanked the federal government for the gesture and for making the burial a memorable one. But he asked for more,a veiled reference to the deceased’s often repeated request for the upgrading of the Federal Polytecnic in Oko to a university of technology. Preaching at the service, the Primate of the Church of Nigeria, the Most Rev Nicholas Okoh, said what the country needed to move forward was integrity in governance with its allied products of honesty, reliability. Okoh, who led over 50 Bishops and over 100 other clerics, said if the new breed politicians could behave like Ekwueme, that the country would be a better place for everyone. “What we need in Nigeria is integrity and its allied products,” he said. “If you are in politics and you do it without it, you will be embarrassed and if you are in business without it, you will collapse. “If we must rebuild Nigeria, we must bring back integrity into the system and it’s allied forces. He urged rapists, kidnappers, ritual killers, cultist and selfish politicians to repent. Former Secretary General of the Commonwealth, Chief Emeka Anyaoku, in a tribute said Ekwueme was not the typical Nigerian politician. 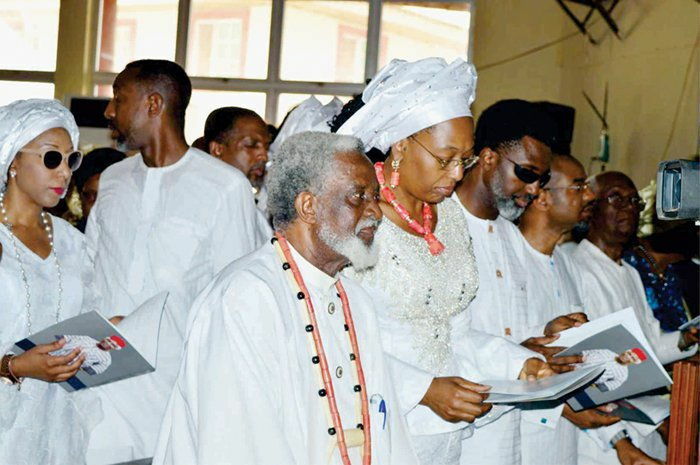 Anyaoku, a close friend of the deceased, said Ekwueme had left a remarkable legacy in three key areas-national and international service, politics and philanthropy. Governor Willie Obiano of Anambra State thanked President Muhammadu Buhari and the South east governors for their dedication in making sure that Ekwueme got a befitting burial. The presence of All Progressives Congress (APC) stalwart, Asiwaju Bola Tinubu, former President Goodluck Jonathan and former Vice President, Namadi Sambo, at the funeral, drew a loud ovation from the massive crowd. Also in attendance were Governors Dave Umahi (Ebonyi), Ifeanyi Ugwuanyi (Enugu), Rochas Okorocha (Imo), Okezie Ikpeazu (Abia),Akinwumi Ambode (Lagos),and Ibrahim Dankwambo (Gombe),as well as a former Chief of General Staff,Commodore Ebitu Ukiwe, national chairman of the APC, Chief John Odigie-Oyegun, and his AGPA counterpart, Dr. Victor Oye. Others were :former First Lady, Dame Patience Jonathan; Minister of Labour and Employment, Chris Ngige; Minister of Science and Technology, Dr Ogbonnaya Onu;Minister of Agriculture, Chief Audu Ogbe; former governors Sam Egwu (Ebonyi), James Ibori (Delta), and Bisi Akande (Osun); former chief of naval staff, Rear Admiral Allison Madueke; Senator Joy Emodi; Prof Jerry Gana; former Governor of Abia state, Senator TA Orji, and Senator Jim Nwobodo.